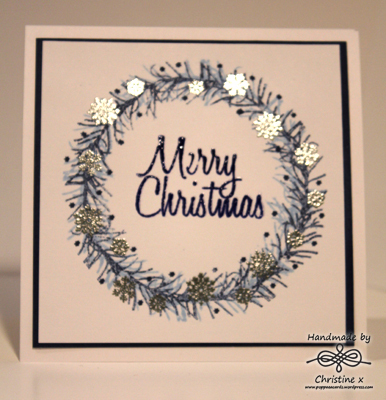 Today I have used a free stamp set from Get Stamping magazine to create a couple more Christmas cards. The foliage stamp started out as a straight stamp so I had to bend it in order to get it to follow my circular template. I used Memento ink in Summer Sky and Distress Ink in Chipped Saphire to give the image depth. The snow flake stamps were a cluster of 3 snowflakes so I had to cut them apart to get the individual stamps. I used Versamark and silver embossing powder on these. The tiny little stars are actually a flower centre from the Avery Elle Laurels stamp set. This second card was incredibly simple. 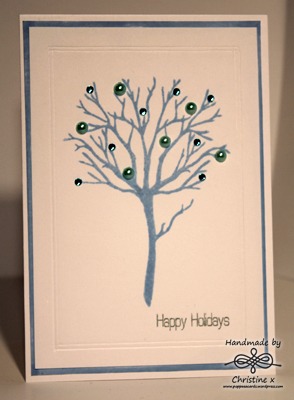 I used Memento ink in Summer Sky for the tree then added some bling and debossed a border around the tree using my scoring board. The sentiment is from the Clearly Besotted Signature Christmas stamp set.